Here's the latest update about the horrific attack in England where a 22-year-old British suicide bomber detonated a homemade explosive, killing 22 people and injuring 59 more. How is Libyan community reacting? Twenty-two people have been killed and 59 injured after suspected suicide bomber 22-year-old Salman Abedi detonated a home-made device at the end of a concert by singer Ariana Grande at Manchester Arena. Police say a lone male suicide bomber detonated a home-made bomb in the foyer of Manchester Arena as crowds were leaving the concert on Monday evening. Twenty-two people were killed in the explosion, including an eight-year-old girl. A further 59 people, including 12 under the age of 16, were injured and taken to hospital. The attacker died at the scene. Eyewitnesses said the noise of the explosion was followed by a flash of fire. Metal nuts and bolts were strewn around the floor among bodies and the smell of explosives was in the air, witnesses said. More than 240 emergency calls were made; 60 ambulances and 400 police officers attended. After the attack hundreds of people in Manchester took to social media to offer spare beds and rooms for those stranded in the city. Salman Abedi, 22, has been named by police as the suspected suicide bomber. Abedi was born in Manchester on New Year’s Eve 1994, the BBC understands. It is thought that he has at least three siblings: an elder brother who was born in London, and a younger brother and sister who were born in Manchester. The family, believed to be of Libyan origin, has lived at several addresses in Manchester, including at a property at Elsmore Road in the Fallowfield area, that was raided by police on Tuesday. Salford University said Abedi had been a student there, but gave no further details. The so-called Islamic State group has claimed responsibility, but this has not been verified. Eight men and one woman have been arrested in the UK since Monday night. They include Abedi’s older brother, Ismail, 23. The woman has since been released without charge. The arrests were made following a series of police raids across Manchester, Wigan and Nuneaton in Warwickshire. 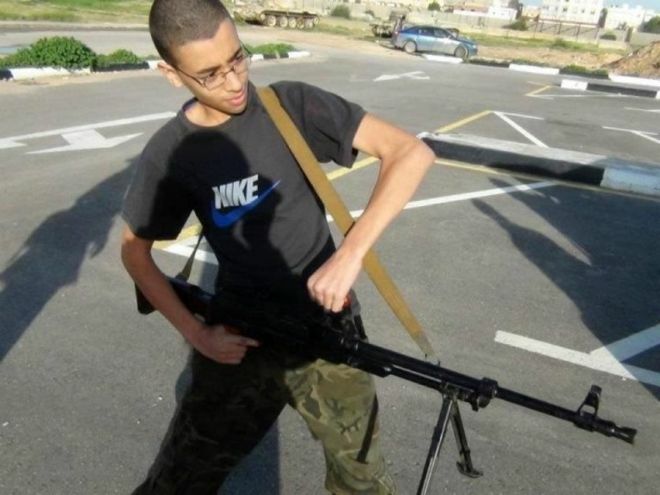 Twenty-year-old Hashem Abedi, Abedi’s younger brother, was detained in Tripoli on suspicion of links with the so-called Islamic State group on Tuesday evening. Reuters news agency has told the BBC that Abedi’s father, Ramadan, has also been detained Libya. Salman Abedi is thought to have been a “mule” using a device built by someone else, the BBC understands. Chief Constable Ian Hopkins said the arrests made in the UK over the past few days are “significant”. “Initial searches of premises have revealed items that we believe are very important to the investigation,” he said. He has previously confirmed that Greater Manchester Police is investigating a network. Meanwhile, police investigating the attack have stopped sharing information with the US after leaks to the media, the BBC understands. UK officials were outraged when photos appearing to show debris from the attack appeared in the New York Times. The threat level “will remain at critical and the public should remain vigilant”, Prime Minister Theresa May said on Thursday. Twenty-two people were killed in the attack. 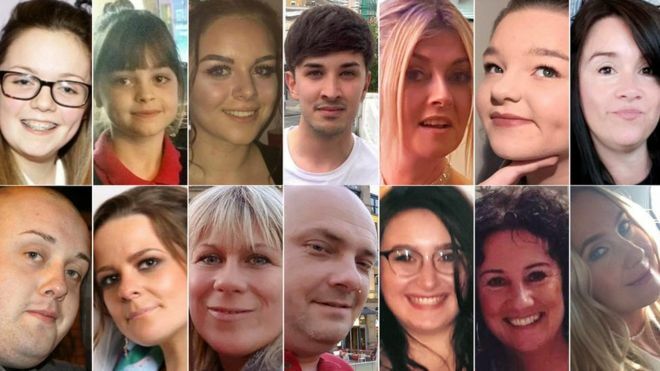 Twenty-one victims have been named so far. The youngest victim to be named is eight-year-old Saffie Roussos, from Leyland, Lancashire. Elaine McIver, an off-duty officer from Cheshire Police, was also among those killed. She was with her partner, Paul, and two children, all of whom were injured. In total, 116 people were admitted to hospital in relation to the attack, NHS England said. Seventy-five people are still being treated in eight hospitals, including 23 patients who are in critical care. A minute’s silence was held at 11:00 BST on Thursday to remember those who lost their lives or were affected by the attack. As a result of the decision to raise the terror threat level – the first time it has been “critical” since 2007 – members of the armed forces will replace armed police at certain “key sites”, Mrs May said. Home Secretary Amber Rudd says 984 servicemen and women have been deployed as part of Operation Temperer – the government plan to put soldiers on the streets. As the security threat has been raised to critical, she has announced that 3,800 extra troops will be available to patrol UK streets. Extra armed police officers will be deployed on Saturday at Wembley for football’s FA Cup Final and at Twickenham for rugby union’s Aviva Premiership final, Scotland Yard has said. Sporting events and venues in England say they are conducting major security reviews. Police Scotland said it was reviewing all “significant events” taking place within the next 14 days and has increased the number of armed police on patrol. And Chelsea FC have cancelled their Premier League victory parade, which was due to take place on Sunday. Eighteen terror plots have been foiled since 2013, including five since the Westminster attack in March, a senior Whitehall source has said. 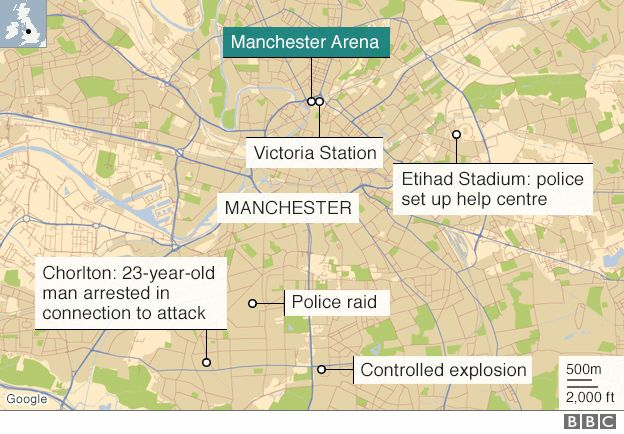 Manchester Attack: What We Know So Far. Salman Abedi, the 22-year-old British man believed to have killed 22. Names and photos of victims being revealed.